Welcome to the Pope's Place. The Pope's Place contains a wide variety of our original Scouting-related information. You will also find a few pages by other authors whose work is hosted because of its significant content. We have selected this information so that it will not duplicate what you can find elsewhere on the Internet. 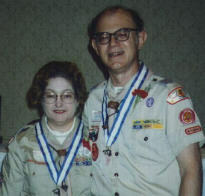 It includes original material on Pinewood Derby race management and race car design, 2-liter pop bottle rocket launcher, Cub Scout Roundtable, and other Scouting topics, as well as a few personal insights by Stan and Barb Pope. Our home is in the central part of Illinois, a few miles south-east of Peoria. It is here that we have reared our children and done our Scouting. Pages are being given a "read it to me" icon at the end of the page title. Some are my own voice and some are "Mary", a mechanical sounding computer generated voice. In the early stages, most will be by "Mary." When clicked, the icon will open a new window to run the corresponding MP3 file. Since December, 2005, I have donated computer time to Einstein@home. This project is attempting to find spinning neutron stars (also called pulsars) by searching in data from the LIGO and GEO gravitational wave detectors. Here is a complete rewrite of my paper on Webelos Science. Problem solving activities are suitable for a day camp setting or a den meeting. At the end of my book Learn to Build a Winner there is a test. The reader is challenged to go beyond the conventional, to step "outside the box" as it were, and design a car that beats a well-prepared car. Here are the answers submitted by talented scholars. A "No-Chart" Racing Method. Complete rework of this page with operational details. It makes "elimination" racing palatable. Wood Badge Memories. 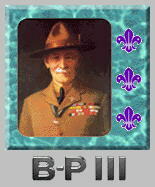 The first in a new series of pages regarding the Wood Badge. Foil Dinners. Includes some solutions to common problems and suggestions for incorporating this cooking method into your Cub Scout program. Woggles, Turk's Head Knots, and Other Single-Strand Braids. Enough detail to construct dozens of different types of braided rings. A Comprehensive "Final Standings" Chart Generator. Stanley Guy Robert - 6/26/98 !!! and Alexander - 7/14/99 !!! and Katherine - 12/8/2000 !!! Stan, K9MFI, has been involved with Amateur Radio for about 40 years. A new site devoted to reporting on current events in Wotamalo District and W.D. Boyce Council has been launched. See Central Illinois Scouting Events for the stories in pictures and words. See a comprehensive index to my free Pinewood Derby writings. Getting ready for Pinewood Derby? Here are some ideas to help you design your next Pinewood Derby Car. This could be the last Pinewood Derby Book you need to read! Pinewood Derby Car racing has been an obsession for me for many years. I have shared the tips and techniques for making pinewood cars faster with my pack members through "work shops" and with other council Scouters through Pow Wow sessions on "Design for Performance." This is a text book on the science and technology of Pinewood Derby Race Cars. Where the other books end, this book is just picking up speed. Others tell you what; I tell you what and why and how and where to look for more! For example, did you ever notice the standard advice to "align the wheels?" But my book tells why and how, step by step. Others tell how to make a fast car using methods that require adult skills. Almost all of the steps presented here are within the skill range of a typical Cub Scout, and the time to accomplish them is within a typical Cub Scout's attention span! If your car is built and Race Day is nearly here, go directly to the section on Wheel Alignment. It WILL make a BIG difference. W W W -- I dared not dream... Some Order of the Arrow insights. Songs of Scouting... a few of my favorites. Here are some helpful words for you if you're a New Cub Scout Roundtable Commissioner who is taking over a dying or dead Roundtable, or if you just want to keep it healthy. Here is an easy to build Roundtable Attendance Board to help award that Attendance Cubbie. Here are some helpful words for you if you're a New District Commissioner. While I'm away, my computer is still at work... being a small part (0.000025%) of the world's largest supercomputer. Copyright 1997, 1998, 1999, 2000, 2001 © by Stan Pope. All rights reserved.